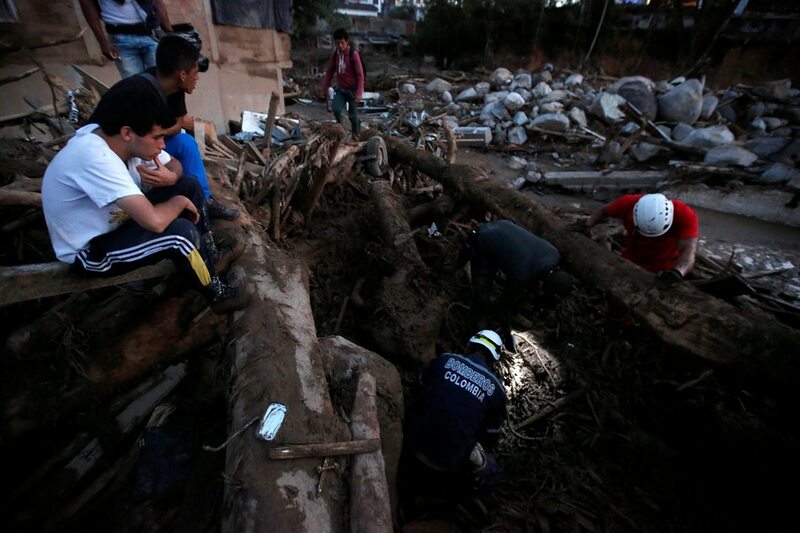 Jaime Saldarriaga, Reuters Posted at Apr 02 2017 09:01 AM MOCOA, Colombia - Flooding and mudslides in the Colombian city of Mocoa sent torrents of water and debris crashing onto houses in the early hours of Saturday morning, killing 254 people, injuring hundreds and sending terrified residents, some in their pajamas, scrambling to evacuate. Heavy rains caused several rivers to overflow, pushing sediment and rocks onto buildings and roads in the capital of southwestern Putumayo province and immobilizing cars in several feet of mud. "It was torrential rainstorm, it got really strong between 11 p.m. and 1 a.m.," said local resident Mario Usale, 42, who was looking for his father-in-law in the debris. "My mother-in-law was also missing, but we found her alive two kilometers away. She has head injuries, but she was conscious." Colombian President Juan Manuel Santos flew to Mocoa, population 345,000, to oversee rescue efforts on the city outskirts and speak with affected families. "We will do everything possible to help them," Santos said after confirming the death toll. "It breaks my heart." The army said in a statement that 254 people were killed, 400 people had been injured and 200 were missing. More than 1,100 soldiers and police officers were called in to help dig people out in 17 affected neighborhoods. Santos gave a lower death toll of 193 via Twitter. Even in a country where heavy rains, a mountainous landscape and informal construction of homes combine to make mud and landslides a common occurrence, the scale of the Mocoa disaster was daunting compared to recent tragedies, like a 2015 landslide that killed nearly 80 people in Salgar, Antioquia. Colombia's deadliest landslide, the 1985 Armero disaster, left more than 20,000 dead. "It's a big area," Mocoa Mayor Jose Antonio Castro, who lost his house, told Caracol radio on Saturday. "A big portion of the many houses were just taken by the avalanche." He said that people were warned ahead of time and many were able to get out, but several neighborhoods and two bridges had been destroyed. Weather authorities said light rains were expected in the area on Saturday night and Sunday. Photos posted on Twitter by the air force showed neighborhood streets filled with mud and damaged houses, while videos on social media showed residents searching for survivors in the debris and struggling to move through waist-high water during the night.